This was a great race and a superb win to the Victorians who did not have it their own way at any time during the race. The WA crew got off to a good start leading the field through the first 500 metres. The Victorians reversed this in the second 500 metres but were unable to shake off the WA crew. The narrow margin of 0.4 second separated these two crews for all the middle 1000 metres of the race. The WA crew then tried a valiant sprint to the line but crossed 0.09 seconds behind the Victorians who held off the challenge. There was another battle for the third place between NSW, QLD and ACT which was going on well behind the two leaders. Duncan Free led all the way and had a strong lead up until the last 500 metres. There was a superb battle for the minor placing going on with the other three scullers which closed the margin for Free over the last 500 metres. The Tasmanians continued their good form in this race despite a great race from the WA crew. 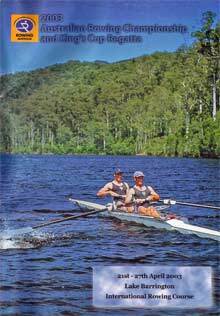 The Tasmanians were in second place for most of the race but stormed home in the final stages to take the lead. The final margin does not reflect the tight racing as the WA slowed after failing to hold off the fast finishing Tasmanian crew. The NSW crew dominated the race from the start and were never seriously threatened. There was an interesting race for third placing between Tasmania and Victoria with the Tasmanians taking the honours. The NSW crew were favourites and they lived up to their reputation. The surprise packet in this race was the Victorian crew who out raced the fancied WA crew and nearly caught the NSW crew. WA led for the first 1000 metres before being rowed through by both the NSW and Victorian crews. The NSW crew were unable to break free on the Victorians who kept the favourites honest throughout the race. Oliver led for the first 1000 metres before being passed by Bradley in the third 500 metres and then Hore in the last 500 metres. Bradley's third 500 metres was superb and set up a great win leaving the others to try and bridge the gap. The South Australians were hot favourities for this event and they did not disappoint. They took a length lead in the first 500 metres and then extended it at every stage of the race. They were never threatened. There was intriguing battle between the first three crews in the middle part of the race but WA took control of the race over the final stages. The margins and changing fortunes during the race created a most interesting event.